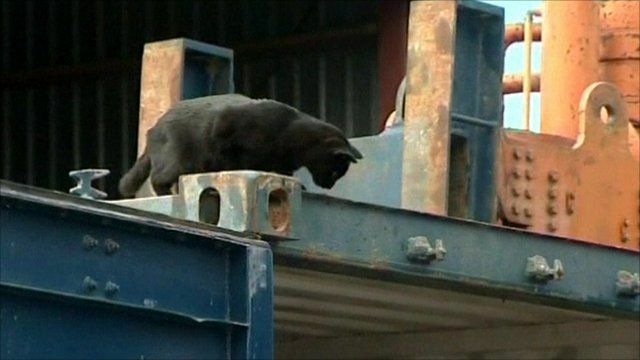 NZ cat found 2,200 miles from home Jump to media player A cat who vanished from his home in New Zealand has been returned - after being found stowed away in a container in Australia. A cat who vanished from his home in New Zealand has been returned - after being found stowed away in a container in Australia. Douglas found himself in Adelaide, after 18 days and more than 2,200 miles (3,540km) in a sealed container. Andrew Leota, who works at the port depot said he noticed when Douglas, had not been making his usual rounds and contacted the Australian Quarantine and Inspection Service about the possible stowaway. After being discovered the feline was given the all clear by a vet and was allowed to travel back home. Mr Leota said Douglas probably survived by drinking condensation on the inside of the container.